Want to learn how to vent a toilet? One SIMPLE way to vent and plumb a toilet using a handful of basic DWV fittings. Keep in mind, there are several acceptable methods to vent a toilet, but the scope of this article demonstrates one easy pattern. This is an overview of a basic pattern to vent a toilet. We’re using a properly sized wye with 45 (more on sizing these pipes in a second). This wye is positioned right under a wall. This allows the toilet vent takeoff to be vertical (that’s important). 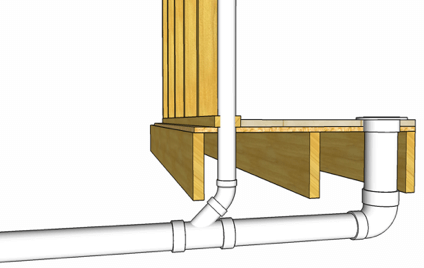 The toilet’s vent continues up the wall, and in many case, this vent can tee into the home’s existing venting system…or the vent can terminate through the roof on its own. Also, notice that the 4 inch toilet flange sits on top of the finished floor. 1. The Toilet’s Drain Size. 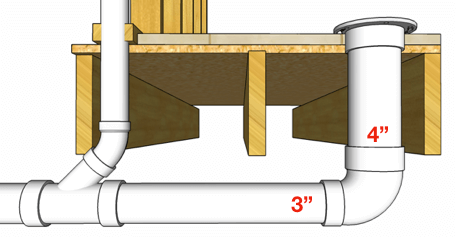 Regardless of your plumbing code, the minimum drain size for a toilet is 3 inches. Water closet’s flushing 1.6 gallons (or less) are rated at 3 DFUs (drainage fixture units). Some older model toilets, flushing over 1.6 gallons per flush, are rated at 4 DFUs. 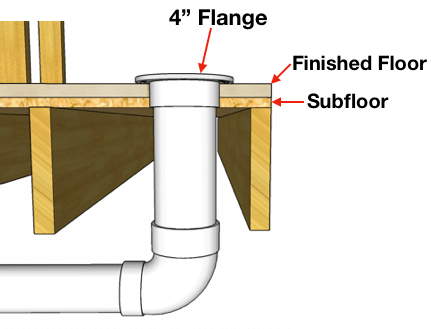 A DFU is the unit of probable discharge that a particular plumbing fixture produces. And drain pipes can only drain a certain number of DFUs. 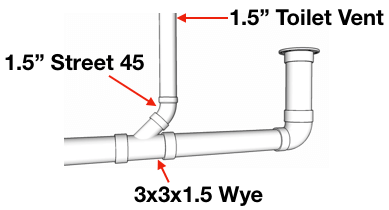 The IPC allows 42 DFUs on a 3 inch building drain. The UPC allows 35 DFUs on a 3 inch horizontal drain. A toilet only produces 3 DFUs. *However, be careful in the UPC…(unlike the IPC), this code puts a limit on the total number of toilets allowed to discharge into a 3 inch drain. Only 3 total water closets are permitted to discharge into any 3 inch horizontal drain in the UPC. The IPC does not have this limitation. It’s 4 inches on the inlet of the fitting and 3 inches on the outlet. 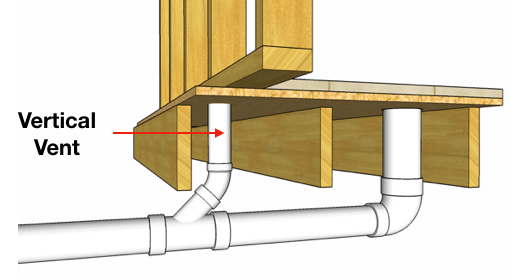 The plumbing code never allows a drain to be reduced in size in the direction of flow. And this fitting is a very wise choice under a 4 inch flange! 2. The Toilet’s Vent Size. And the answer is yes, your toilet has to have a vent. And the size of this vent pipe depends on your local plumbing code. And that’s because individual vents in the IPC are sized at no less than one-half the diameter of the drain served. As you know, the minimum drain size for a water closet is 3 inches. Half of a 3” drain gives us 1.5”, and that’s the size of the stool’s vent. This is based off 906.2 of the IPC. To install this 1.5” vent, notice we’re using a 3”x3”x1.5” wye, with an 1.5” street 45. Again, this is IPC only. Your toilet’s individual vent needs to be 2”. (See UPC Section 904.1, Table 703.2, and Footnote 3 of Table 703.2). And if that’s you, install a 3”x3”x2” wye, with a 2” street 45 to vent this toilet. I’ll also quickly mention…in UPC jurisdictions it’s common to see one toilet in the home plumbed with a 3 inch vent. The purpose of this oversized vent is to meet the UPC’s aggregate venting requirement. In a nutshell, the UPC wants the building sewer to be properly vented. So a vent pipe the same diameter as the building sewer needs to connect from the drainage system, and extend through the roof, undiminished in size. One popular way to meet this requirement is by plumbing one toilet with a 3 or 4 inch vent. And again that’s UPC only, the IPC does not have this same aggregate venting requirement. 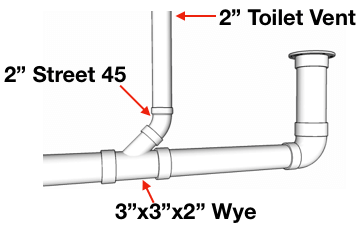 AND you want to learn how to plumb a toilet with a 3″ vent, here’s a “Free Diagram” demonstrating a popular way. 3. The Toilet’s Trap Arm Length (aka Trap To Vent Distance). 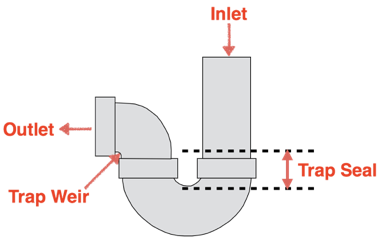 The toilet’s trap arm, also referred to as the fixture drain, is the pipe between the trap and the vent. This distance depends on your local plumbing code. If you’re in the IPC, there is no limitation in length for the toilet’s trap arm. That’s right, no limitation! That means your fixture drain can have an unlimited distance (909.1). Keep in mind your toilet still needs a vent, but your trap arm can be as long as necessary. In the UPC, the toilet’s trap to vent distance is limited to 6 feet. And here’s how the UPC wants this measurement taken. 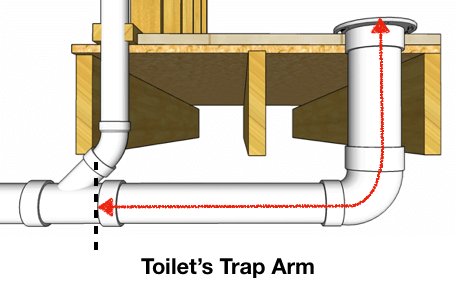 Measure from the face of the closet flange, along the centerline of the pipe, to the inner edge of the vent opening. So those in UPC jurisdictions, simply make sure this distance is 6 feet or less (Footnote 2 of Table 1002.2). 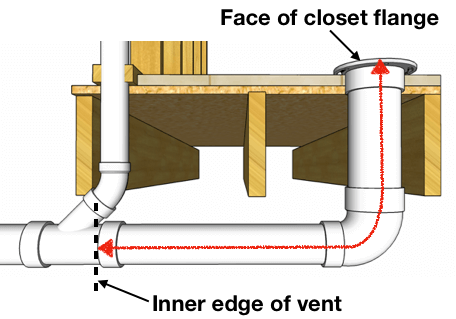 Additionally, if you plumb your toilet with a 4 inch toilet drain (which isn’t usually necessary), the UPC still limits the trap to vent distance to 6 feet. All plumbing fixtures need to have a trap. Inside a p-trap is 2-4 inches of standing water. This standing water is called the trap seal. The trap seal is what blocks sewer gas from invading into your home. But never install a p-trap for a toilet! Why? Because toilet’s have internal traps. Double trapping a plumbing fixture in series is a code violation. 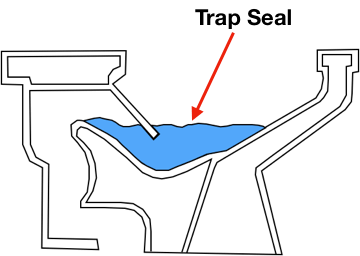 The second trap causes unnecessary obstructions in the flow of drainage. Did you know when you open the lid of your toilet, you’re looking at the top of the toilet’s trap seal. All right, that wraps up this basic pattern to plumb and vent a toilet. For example, you won’t be able to fit this pattern in second story floor joists (unless you like the look of drains protruding from your ceiling.